Today I'm sharing a tried-and-true recipe that I find myself making more often than not: chocolate sorbet. 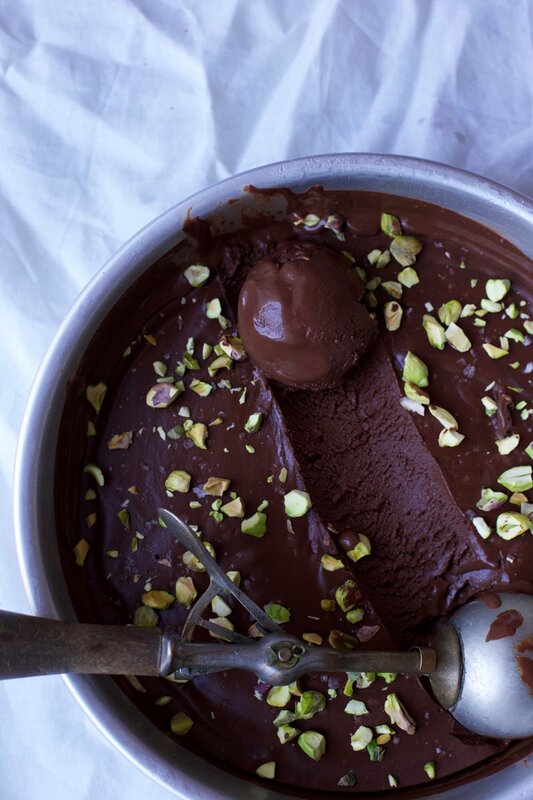 And it's not just any chocolate sorbet; it's David Leibovitz's recipe. David, an amazing and well-known pastry chef, is my go-to guy for the best ice cream-related recipes for many reasons, but mainly because he wrote the book on it - literally. When I was gifted my Cusinart ice cream machine years ago, the first recipe I tried was David's mint chocolate chip ice cream. Even though the recipe was pretty daunting because I had never even attempted making custard before (it was a custard-based ice cream), I was hooked when the final product was better than any other mint ice cream I had ever tried. Don't worry, I'll do a post for this ice cream in the future! But today, we're not discussing ice cream... we are discussing it's much easier to make cousin, the sorbet. Sorbet by definition has no dairy in it, but makes up for that loss with plenty of sugar. Fruit flavors are usually the standard when it comes to sorbet, but being the chocolate lover that I am, I tend to stray from those kinds. With that said, I knew that I had to try David's chocolate sorbet when I came across it on the internet. With only six ingredients, one of those being water, this sorbet goes against all odds. Sorbet may tend to have an icy texture due to the lack of dairy in it, but this recipe yields a very creamy and rich sorbet, almost to the point that you are 100% sure that there has to be dairy in it. David actually credits the amazing texture to the high proportion of bittersweet chocolate that is added. This recipe is just so easy and delicious that it's almost a given to find a batch of it hidden in my freezer somewhere. When Alex and I are trying to cut back on dairy but are craving ice cream (we both would eat ice cream every day if we could), this is the perfect dessert to reach for. And if you want to impress your vegan or lactose-intolerant friends, I highly suggest whipping this recipe out. It's much, much better than the fruit salad you were planning on putting out instead. I promise. Once again, I am giving you the option to weigh out your ingredients in grams using a kitchen scale. David includes both options (weight and volume), as do I, so feel free to use either. This was my first time making the chocolate sorbet using the scale, and I gotta say that I think it yielded my best batch yet. Just saying! 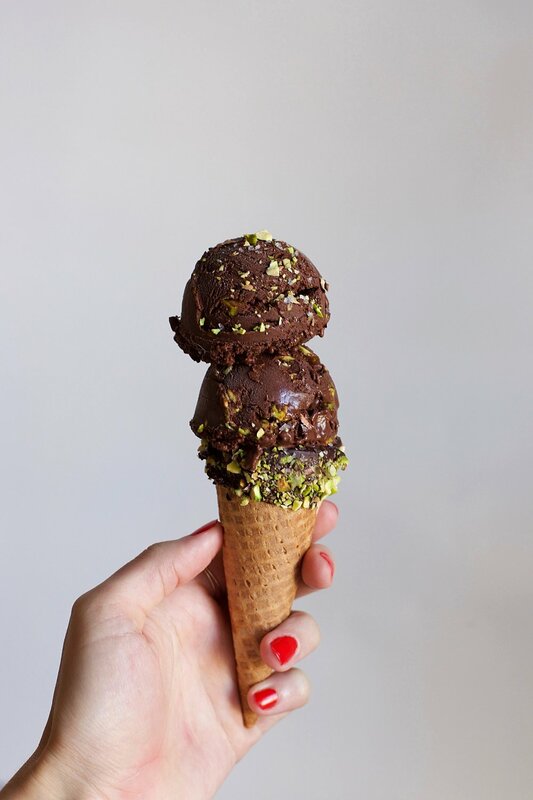 ALSO, if you're wondering about my ice cream cones, I simply dipped store-bought sugar cones into melted dark chocolate and sprinkled chopped pistachios on top. I thought it not only would look cute, but compliment the sorbet perfectly, especially since my favorite way to enjoy the sorbet is with pistachios. In a large saucepan, bring 1 1/2 cups of the water, the sugar, cocoa powder and salt to a boil, whisking frequently. Let it boil for 45 seconds, as you continue to whisk it. Take the saucepan off the heat and stir in the chopped chocolate. Once smooth, stir in the remaining 3/4 cup of water and vanilla extract. Pour the liquid into a blender and blend for 15 seconds. Transfer to a bowl, cover with plastic wrap, and refrigerate until thoroughly chilled. If your mixture has thickened up while chilling, whisk it until it softens up a bit. Churn the mixture in your ice cream machine according to the manufacturer's instructions. Serve with flaky sea salt and chopped pistachios sprinkled on top, if desired. Enjoy!